1byone® New Release - The World's First Smart Portable Car Jump Starter. - Start Your Car Countless Times !!! 9000mAh 12V Multi-Function, UltraSafe Lithium Jump Starter, Emergency Auto Car Battery Charger Jump Starter With Portable Power Charger, Ultra-bright LED Flashlight for SOS, High Capacity Battery Charger Power Bank for Smart Phones and Other Digital Devices - 1 Year Limited Warranty. Hot new release ~ Powerful jump starter to safely jump start a dead battery in seconds. Supports fast charging. Low self-discharge.Up to 1000 cycles. Be sure to pack this when you go camping, picnicking or go on any outdoor adventure. Ultra-portable ~ Portable, compact, lightweight design that will easily fit in your backpack, or glove box for convenience. Help car start by a simple clip and no need to disconnect the original car battery. Compact size but high power. 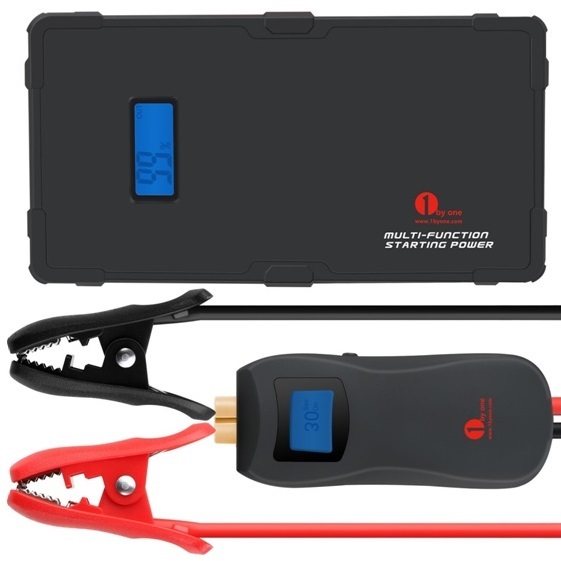 Ultra-safe and error-proof ~ offers spark-proof technology and reverse polarity protection, which allows it to safely connect to any battery.Multiple safety design ensures jump starter is mistake-proof. Find your way safely after dark ~ thanks to the built-in LED that functions as a flashlight and can send out SOS distress signals. It is the ideal choice for night shift workers, overtime workers and many others. Recharge your USB and other devices on the go ~ charges mobile phones, Sony PSP, MP3/MP4 players, PDAs, notebooks, car refrigerators and other compatible appliances.